This healthy noodle salad is one of my favorite lunch recipes. Tossed in a tangy, nutty sauce, it's filled with crispy chickpeas & lots of veggies. Today, I’m taking a break from soup season (although I do have some good ones in the works! ), because it’s been about 95 degrees lately and a big, cold noodle salad just sounded good to me. This bowl is full of whole grain noodles and crunchy veggies that are all tossed in a deliciously creamy, nutty tahini sauce. In an effort to feel some “fall spirit,” I roasted chickpeas and carrots and tossed those in too. Cooked carrots haven’t always been our thing – the trick is to roast them until they’re slightly tender but still have some bite (just don’t let them get mushy!). If you’re still not convinced, roasted broccoli or cauliflower would be delicious here instead. This noodle salad recipe is very flexible, so you should use whatever vegetables you like. A creamy, flavorful sauce is the key to not-boring noodles. 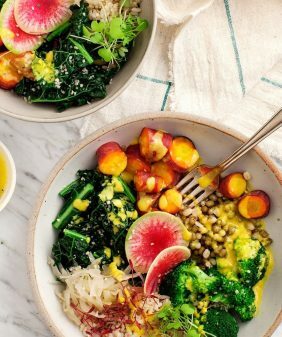 But sometimes I get tired of breaking out the blender or food processor, so you can simply stir together this tangy tahini sauce. If you eat this noodle salad for dinner, don’t forget to pack up the leftovers (if there are any!) for lunch the next day. These noodles were delicious on day two. 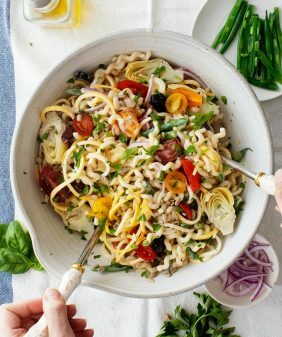 Let me know how this noodle salad turns out for you in the comments! 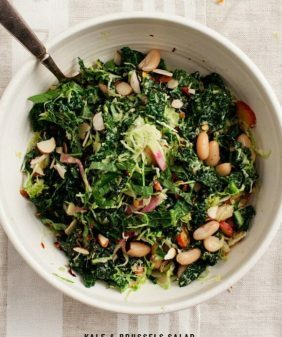 If you like it, check out this kale salad, this noodle bowl, or this list of my favorite lunch recipes. 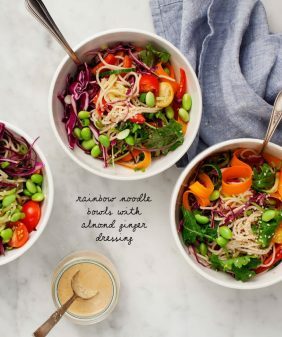 This tahini noodle salad is easy to put together - just whisk up the sauce and toss it with noodles, chickpeas, and roasted & raw veggies. 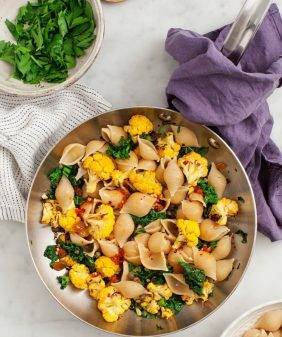 A great recipe to pack for lunch! 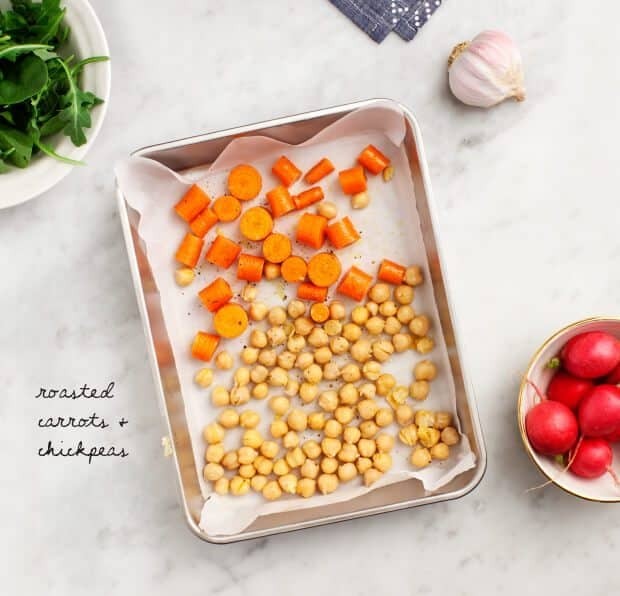 Place the carrots and chickpeas on the baking sheet, drizzle with olive oil, sprinkle with salt and pepper, and toss. Roast for 15 to 20 minutes, or until the carrots are tender but still have a bite. Make the sauce: In a small bowl, stir together the tahini, peanut butter, olive oil, garlic, lime juice, rice vinegar, sriracha, water, and a pinch of salt. Taste and if it’s a little bitter, add the honey, if desired. Season to taste with more salt or sriracha. If necessary, add more water until the sauce is a drizzle-able consistency. Bring a medium pot of salted water to a boil. Prepare the noodles according to the instructions on the package, cooking until al dente. Drain and rinse in cold water. In a large bowl, toss the noodles with a generous scoop of the sauce. Add the cucumber, radishes, greens, carrots, chickpeas, and hemp seeds and toss with the rest of the sauce. Taste and adjust seasonings. Serve with lime slices on the side. *Vegan option: use agave or a pinch of sugar instead of the honey. This really looks tasty. Love those noodles and sauce! Yum. I moved to Texas this Spring, and I’m finding this weather most perplexing!! 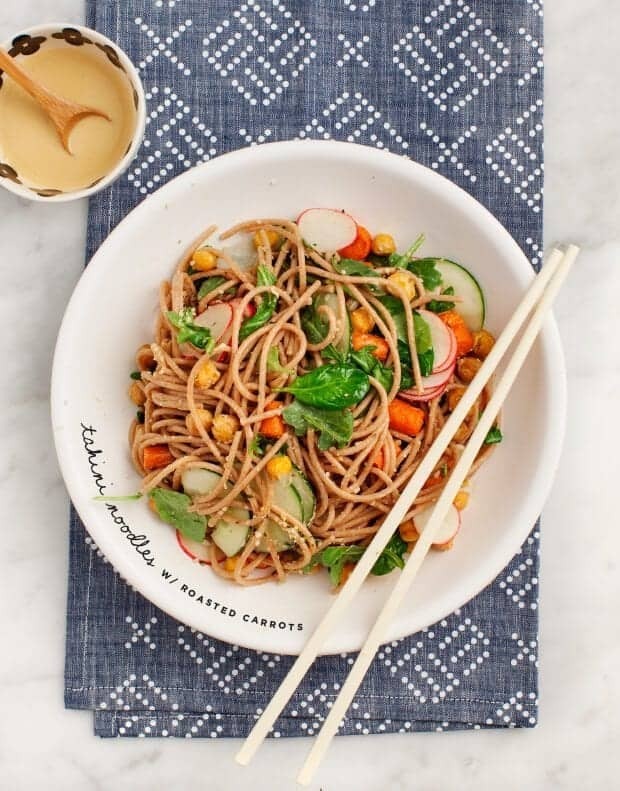 Thanks for the soup break, these tahini noodles look awesome! I need to try this! I’ve literally fallen in love with your blog and recipes, they gonna revolutionaze my erasmus cuisine. Thank you for that! My husband and I aren’t into cooked carrots, either, usually. I roasted some for a curry the other day and asked him if he liked them: “Hmm, they’re okay like this.” We’re approaching them with the caution of people who grew up with mushy carrots. So far, so good. I’ve been wanting to try roasting garbanzos too, so I’l give this one a try! Ha, it took us awhile, but we’re good with cooked carrots now, so there’s hope :). (High heat, less time is the key). I know right?! It is soooo hot here inTx! This looks beautiful AND yummy! Tahini is one of my favorite foods so I can’t wait to try this one! This looks so tasty and flavourful! Roasted carrots with tahini, it sounds so good. This noodle bowl looks delicious. This looks so tasty, I’m going to have to try it out! Love, love, love tahini, this sauce sounds awesome! Roasted chickpeas and carrots are so wonderful! 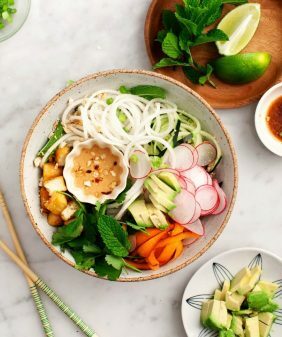 Love this noodle bowl! Made this today for dinner. Added some ginger crusted tofu as well. It was a bowl full of goodness. My boys(4, 8 and 11) and the hubby begged for seconds. Can’t wait tobuy your book! Ha, thanks! I’m so glad your family enjoyed this one! This is absolutely amazing! I made it for my husband and me a few weeks ago and it is sooooo good! It’s in my rotation for dinner this week. Instead of chickpeas, I’m going to try edamame! Thanks for the wonderful recipe!